Coronation Street actor Marc Anwar has been sacked from the ITV soap after posting alleged "racially offensive" comments on Twitter. ITV said the Pakistan-born actor, who joined the soap as Sharif Nazir in February 2014, would not be returning to the show "with immediate effect". Screenshots of messages posted on his private Twitter account appear to show Anwar branding Indian people "b******ds" and "p**s-drinking c**ts". 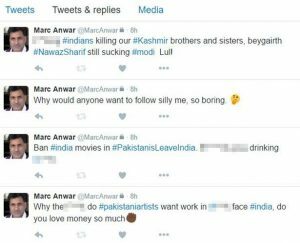 In a statement, ITV said: “We are deeply shocked by the entirely unacceptable, racially offensive comments made on Twitter by Marc Anwar. Anwar's character had been a member of the first Muslim family on the street. His sacking comes at a high profile time for his character, with Sharif currently embroiled in an affair storyline that will see him blackmailed by granddaughter Alya over secret trysts with Nazir family friend Sonia. ITV has not revealed how the plotline will resolve itself in the wake of Anwar's sacking. UPDATE: Anwar has now issued a video apology in relation to the tweets. He said: “I would like to offer my sincerest apologies to anyone that I may have offended with my tweets on Friday evening and especially people from India,” he said.